Northwood's Eldad Mulugeta said that he was expecting about a 9:15 in his first 3200-meter race since racing at Nike Cross Nationals, so he was not incredibly shocked when he finished first in 9:11.14. 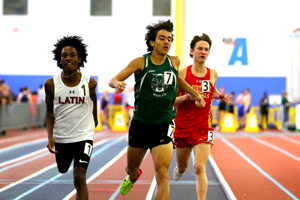 An early fast pace played perfectly into his favor and he dropped the loaded field between laps 13 and 14 to record one of the fastest indoor 3200m's in Montgomery County history. "I knew Sam Keeny [South River] had more speed than me so I had to take him out of the race. I had to go early, like three laps to go. I planned that and it worked out." His early kick, if you want to call it a kick with a half mile left in the race, was necessary because Keeny and company gained ground over the final lap. Keeny finished just two seconds back in 9:13.90. Two more boys went under 9:20 with two more under 9:30, making it the deepest 3200m race in Montgomery Invitational history, even though Mulugeta just missed the meet record of 9:09.98. According to Mocorunning's records, 9:11.14 was the sixth fastest indoor 3200-meter performances ever by a Montgomery County runner. 9:17.16 by Northwood's Obsaa Feda ranks #9 all-time indoors according to Mocorunning's records. Mulugeta and Feda will run the 3200 with an even deeper field at the Virginia Showcase next Saturday. 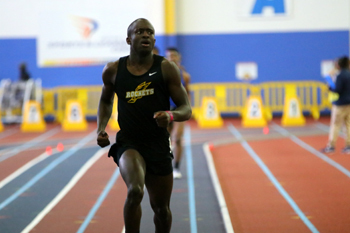 Richard Montgomery's Seydi Sall dropped an all-time MCPS #3 performance, 1:05.03, in the boys 500m. 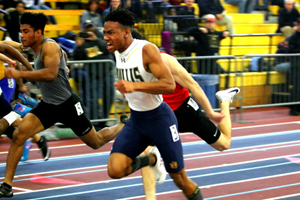 It was 0.8 seconds faster than he ran a week earlier at the Southern Maryland Invitational, but the junior who ran 1:05.34 as a freshman maintained a tone of caution when he spoke. Said Sall, "I kept straining my left hamstring. Last year I strained it probably four times. It made me miss both the indoor and outdoor season. Then I started running back in summer track." Sall explained that he is still only "85% healthy." "My goal for this season is just to stay healthy. I'm positive that if I stay healthy, great things will happen." 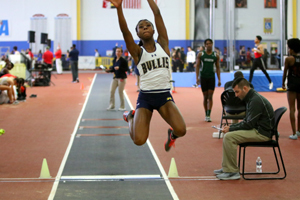 Bullis School's Aniella Delafosse exploded onto the scene last winter when she recorded several long jump performances over 18 feet and ultimately recorded a mark of 19-04 with a head wind at New Balance Outdoor Nationals. Her 18-07 second place performance at the Montgomery Invitational bodes well for an even better senior campaign. Said Delafosse, "Today was kind of another chance to get on the runway before Virginia Showcase to see where I was at. It is my second meet jumping and I did PR for indoor so I think it's going pretty well." It did not bother Delafosse that she was up against another national-caliber athlete in Jada Seamen from McDonogh School. Seamen recorded the winning mark of 18-10 early in the competition. Delafosse improved throughout the competition as she recorded three marks in the 17's in the prelims and three marks in the 18's in the finals. Delafosse aspires to break 19 feet indoors and 20 feet by outdoor, both of which would be all-time Montgomery County records. 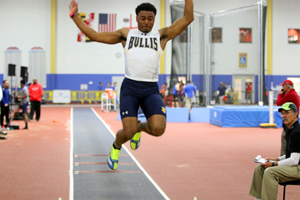 Bullis School's Caleb Mauney made a big leap from his sophomore year to his junior year. He ran 6.60 in the 55-meter dash as a sophomore and dropped to 6.49 in his junior year debut to become the 2019 Montgomery Invitational champ. He attributed his improvement partly to just being a year older but also to hard work year around. He said that he had been preparing for about a year so you can imagine that he was eager to get back on the track. Though he was proud of the final result, he explained that his execution was not perfect. Said Mauney, "In the prelims, I was bent over a little too much coming out of the blocks. In my mind, I'm thinking in the finals that I need to stay up, so I stayed up the whole time instead of gradually working up." Mauney aims to fix his technique and shave a little time off his PR's in every meet this season. 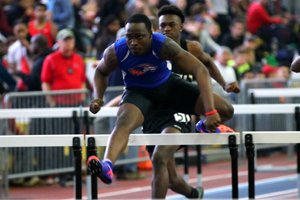 Watkins Mill's Amadou Silimana became just the third Montgomery County boy to ever win the 55-meter hurdles at the Montgomery Invitational. He did so with a new personal best of 7.78. Said Silimana, "During the prelims, I didn't use any blocks. I talked it over with my coach and he told me to use blocks and keep my head down which I did. I just kept my head down as I was going over every hurdle and perfecting my form throughout the whole way." Silimana said that he wants more and is trying to drop into the 7.4's this season. Northwest High School's Whitney Snyder went from 11th place at last year's Montgomery Invitational to first place at this year's Montgomery Invitational. 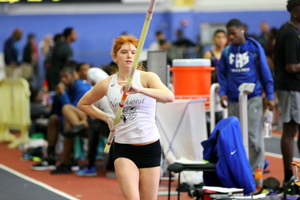 And while she was a state qualifier last year, her recent performances this indoor season rank her among Montgomery County's all-time best pole vaulters. Her rapid improvement comes after joining DC Vault last July. After setting another personal best, 10-feet, Snyder explained, "Before I was on a five left run and a shorter pole. Today I moved onto a longer pole and took seven steps so I had a lot more speed and could swing higher." She was feeling so confident after clearing 9-00, 9-06, and 10-00 without any misses that she requested the bar be raised to 11-feet. Her only misses of the day came at 11 feet, but she was thrilled to win a major competition for the first time. Also climbing Montgomery County's all-time pole vault rankings are Blair's Deeya Garg (9-06, 2nd) and Gaithersburg's Zachary Jones (12-06, 3rd). The tightest race of the day came in the boys invitational mile. There must have been a half-dozen lead changes before Luke Tewalt of Latin and Rodrigo Yepez-Lopez of Walter Johnson began to string out the field. Yepez-Lopez had the lead on the final lap, but Tewalt got the win with a lean that could only be decided by a photo finish. Tewalt was attributed with a 4:24.02 and Yepez-Lopez was attributed with a 4:24.04. Blair High School improved the county's top performance in the 4x800 (8:09.97, 2nd) and Blair's Nathaniel Kinyaunjui lowered this county's top performance in the 800m (1:58.75, 2nd). 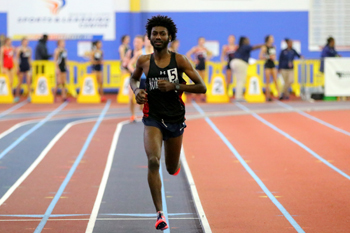 Additional event winners include Gaithersburg's Michelle Kamara in the 800m (2:24.83), Whitman's Breanna McDonald in the 1600m (5:19.60), Northwest boys 4x200 (1:33.40), Northwest boys DMR (10:59.16), and Bullis's Austin Allen in the long jump (22-00.75). The boys long jump was cut short as was the 4x400 due to concerns over winter precipitation. Though it was only snowing lightly outside the Sportsplex, MCPS canceled activities originally scheduled after 5:00 PM. MCPS would have allowed the Montgomery Invitational to conclude as planned, but many athletes were leaving on their own and event organizers called the meet early for the sake of transportation safety.